SCT1001 series connectors are replacement of JST SH Series connectors. with 1.0mm pitch space compact, low profile design. Socket with locking feature mating crimp housing. The SH 1.0mm Pitch connector is a low profile connector for small-sized devices. They are heavily used in small racing drones. Like the 0.8mm pitch connector, SH 1.0mm pitch connectors are also suitable for densely crowded electronic devices due to its small diameter wirings. Scondar offers a crimp style lock and a configuration which prevents users from inverted insertion. Suitable for either power transmission systems or chassis wiring. Scondar offers a variety of SH 1.0mm Pitch connectors with different models, in different dimensions, with top or side entry configurations and with 2 to 20 circuits which might suit your specific need. No alloy was used in fastening the wires to the board, but through the use a crimping method, which makes it more flexible and mechanically stronger. The crimps are well engineered to be air-tight, preventing oxygen and moisture from reaching the metals, causing corrosion. Thus, the connector can be easily removed from the head without holding the wires. Furthermore, it prevents the cables from being easily disconnected due to entangled routing or heavy loads. The connector is also compatible with SR insulation displacement connector. With its improved product enhancement, the connector has the capability of withstanding voltage of 500V AC per minute, which means to say that the insulation is sufficient to protect the user from electrical shock, overheating and fire. The header contact is made up of copper alloy, tin plated over a phosphor bronze material. The housing is made of PA UL94V-O natural ivory. These housings are available with or without protrusions. The solder tab is made up of brass, copper undercoated or tin-plated. The temperature range for the 1.0 mm connector is -20 degrees centigrade to +85 degrees centigrade. This range is based on the rise of temperature with increasing current. Insulation resistance and contact resistance are of 100 Megaohms per minute minimum and 20 mega ohms maximum, respectively. The 1.0mm Pitch Connector can be used for AC and DC operations with a rated current of 1.0 amperes and 50 Volts. It is applicable in both chassis wiring and power transmission wiring with a maximum amperage of 1.0Amp and 0.2 Amp, respectively. The connector can be used with the wires of AWG within the range of #32 to #36. This applies to wire diameters as small as 0.127mm to 0.2019mm. Super fine wires such as these can help the routing job. The pin header of the connector is wrapped with a thin plastic guide box around it good for preventing cable connection mishaps and it also provides good guidance for the mating connector. Twin U-slot section or twinaxial cable has a pair of insulated conductors where the conductors are run parallel with one another. This is commonly used in high-speed balanced-mode multiplexed transmission in large computer systems, in which the signals are carried by both conductors in a U-shaped configuration. This ensures reliable connection and provides greater noise immunity. There are three available variants for this connector depending on its desired usage, such as low-profile, IDC and compact. The housing and wafer package are available as 1000 Pcs per bag. For terminal purpose the available package offers 20,000 Pcs per bag. 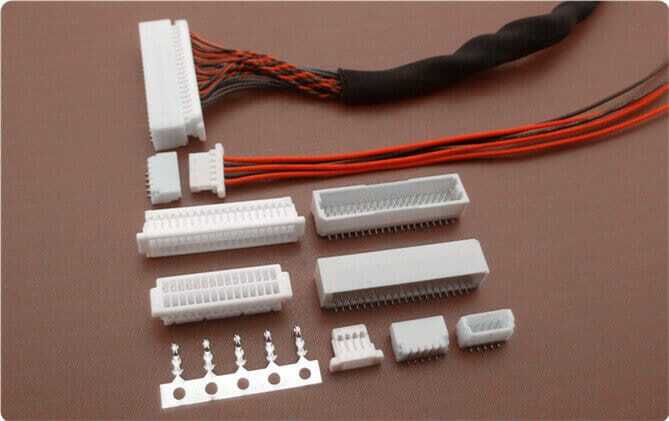 For wire harness, you can ask for custom materials with 1000 Pcs/bag. 1.0 mm pitch serves as the best choice for densely crowded electronics systems for its small, square-edged configuration, ruggedized and shock resistant feature. The 1.0 mm Pitch connector can either stand as power contacts, signal contacts or both as power and signal contacts or a signal and grounding contact. The wiring harness interconnects the PCB to various components that sends signals and power to other electronic devices. SH 1.0mm pitch connectors ensures safety, system protection and performance with its bonded metallic conduits and multiple grounding points preventing fire hazards, component damage, overheating and possible electrocution. The product does not contain restricted chemicals in concentrations not complying with ROHS standards. Thus, for its components, the products can be worked upon at high temperatures required by lead-free soldering. 1.0 mm Pitch Connector finds its advantage in devices such as, Multi-function/printer office machines, gaming electronics, Imaging and digital cameras, security systems, VCRs, PDAs, computer, notebook, speaker, headlight, engine, stereo, LCD, LED lamps, battery, lamp strip, fan, car, headlights, PCB, television. Scondar is China-Based connectors & customs wire & cable assemblies manufacturer, providing reliable wire to board, wire to wire & board to board connection solutions.Our factory has full ISO 9001:2015 certification.